The most valuable vintage teddy bears made by Chiltern was known as Master teddy. He was the first bear they made in 1915 and was fully dressed in trousers and jacket or shirt. He has a very distinctive look with rather bulging eyes and is made with a Mohair head and limbs and fabric body, needless to say he is a very rare find. Hugmee bears were the most popular Chiltern bear and were first made in 1923. These bears were made for some time but of course the early Hugmee bears are the most sought after. 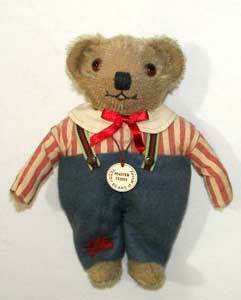 A vintage bear from Chiltern will carry a simple label which reads "Chiltern, Hygienic Toys, Made in England". When the company was taken over in 1967 by Chad Valley, a label which read "Chad Valley Chiltern Hygienic Toys Made in England" was used for a short time.